Who Can Enter? 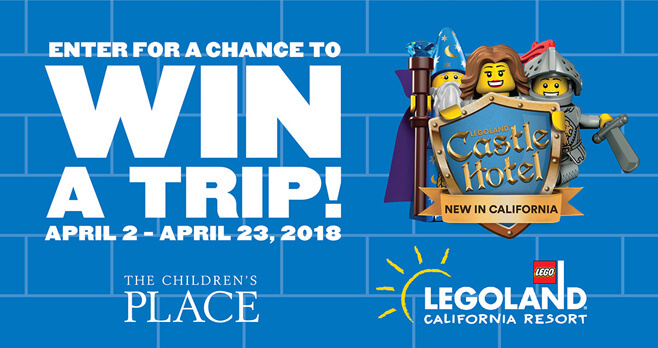 The Children’s Place LEGOLAND Sweepstakes is open only to legal residents of the 50 United States and D.C., Canada (excluding Quebec), and Puerto Rico, who are at least 18 years of age or older as of date of entry (except in Alabama, Nebraska, British Columbia, New Brunswick, Newfoundland, Nova Scotia, Northwest Territories, Nunavut, Yukon participants must be 19 years or older to enter, and in Mississippi and Puerto Rico participants must be 21 years or older to enter). When To Enter? Sweepstakes begins at 09:00:00 AM ET on April 2, 2018 and ends at 11:59:59 PM ET on April 23, 2018. What Is The Sweepstakes Prize? The Grand Prize consists of a trip for four to LEGOLAND California. Who Are The Sweepstakes Winners? To receive the list of winners of prizes, send a #10 self-addressed, stamped envelope for receipt by April 30, 2018 to: The Children’s Place & LEGOLAND: LEGOLAND Castle Hotel Sweepstakes Winners List Request, c/o Realtime Media, 200 Four Falls Corporate Center, Suite 100, Conshohocken, PA 19428.